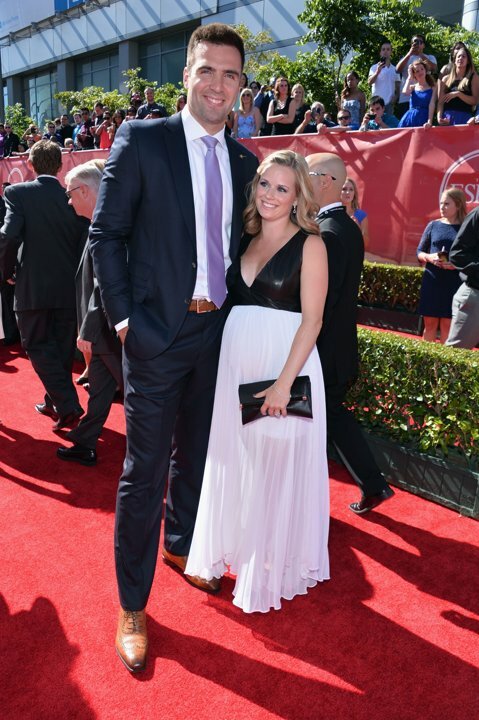 Sports biggest athletes in sports all came together last night for the 2013 ESPYs at the Nokia Center in Los Angeles. The ESPYs have become more like the Oscars for pro athletes. The event continues to progress every year. 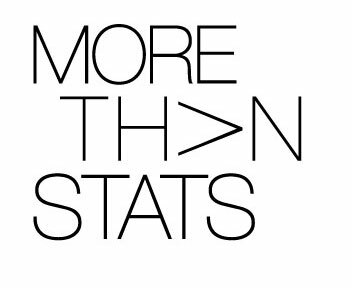 It’s also become the ultimate fashion show for pro athletes, as they dress to perfection, bringing out their very best attire. Now let’s get to the main event, check out the most stylish looks of the evening below. Whose attire caught your eye? 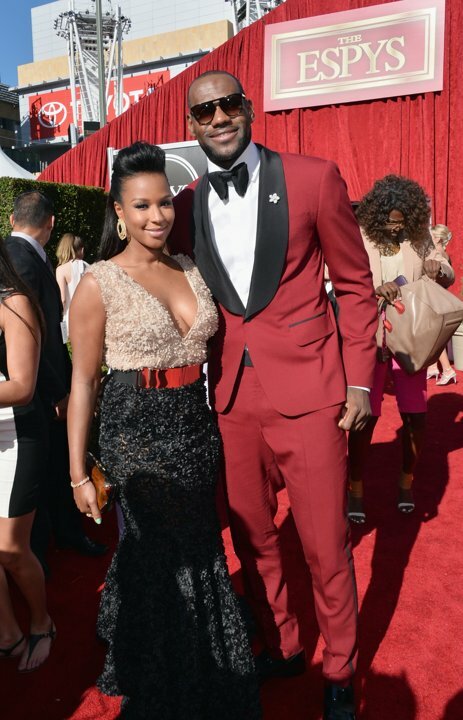 King James suit was on-point, Lebron enrobed in a bold red tuxedo by Wariare Boswell. Dapper! When I saw Dwyane Wade’s suit I instantly thought ‘Scarface’ Wade reminded me of a classy 1980’s gangster, as he accessorized his Lanvin tuxedo with a chic scarf. 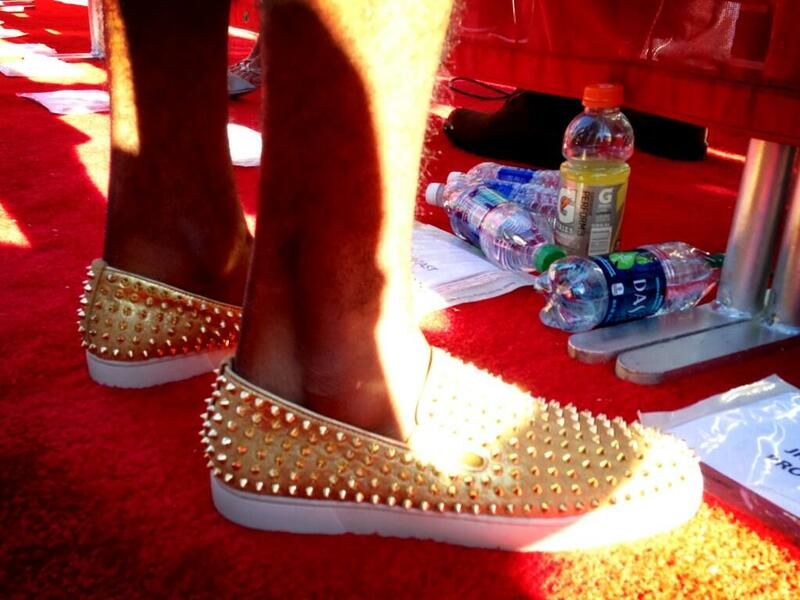 Wade added a modernistic feel to his ensemble with a pair of red Balenciaga sneakers. 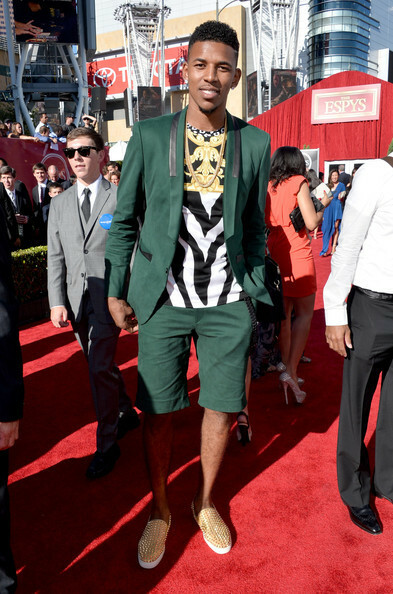 Nick Young aka Swaggy P is living up to his nickname, the newest addition to the Lakers brought his fun urbane style to the ESPYS. Nick went with a very trendy “Short suit” as he combined green chino shorts, with a matching blazer jacket. Nick added flashy to his look with a print t-shirt, and gold Christian Louboutin roller boat spike flat sneakers which complemented his gold chain. 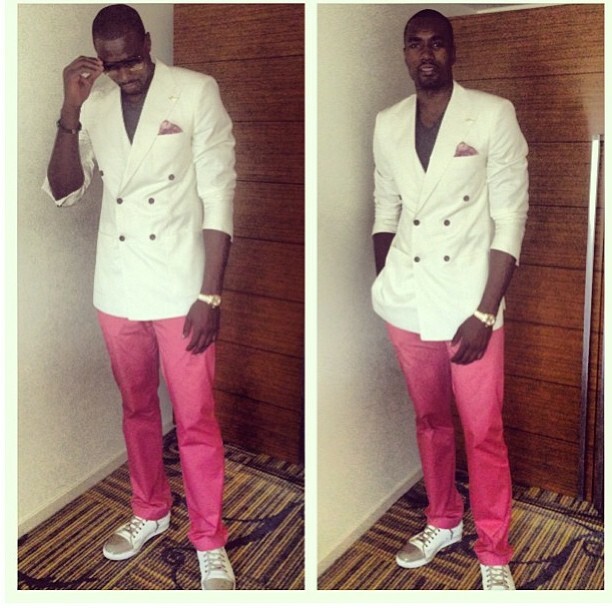 NBA defensive machine Serge Ibaka (OKC Thunder) made a bold fashion statement with his pink trousers. 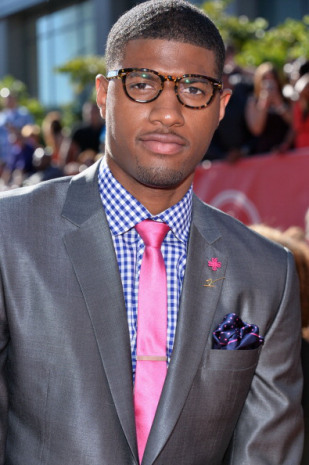 Detail is key, NBA star Paul George (Indiana Pacers) paired a sleek solid grey suit with a gingham patter shirt, and rose pink solid necktie. Paul added sophistication to his attire with tortoise framed eyewear. 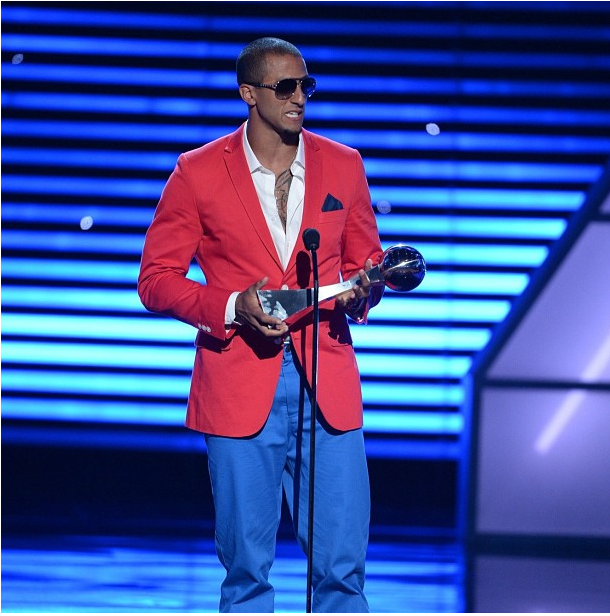 Colin Kaepernick matched a smooth red two-button blazer jacket, with blue trousers. Color-blocking to the fullest. Colin was dressed by Elevee . Superbowl champ Joe Flacco elected to keep his attire subtle, donned a in a tailored navy suit. Victor Cruz (NY Giants) dressed in a solid double-breasted Tommy Hilfiger suit he combined with a stripe crew neck, and a chic pair of vibrant shoes with contrasting soles. The double-breasted suit isn’t easy to wear, but Victor made it look effortless. 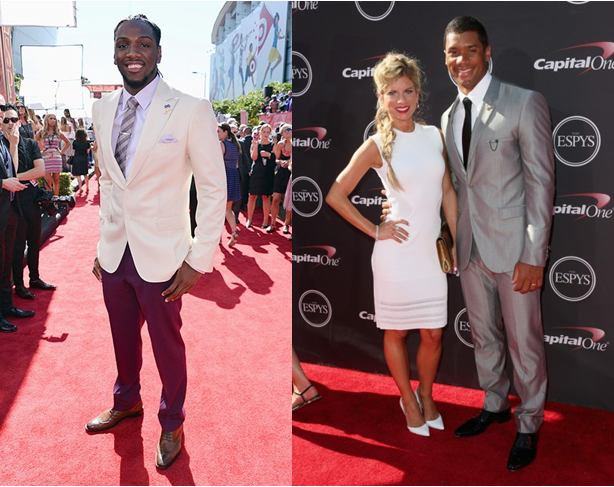 NFL Ballers Brad Smith and Terrell Suggs both looked fantastic clothed in a striped threads. Chandler Parsons ( Houston Rockets) spruced up his sharp tailored suit with a floral print collar shirt. Prints are definitely a big trend for the summer. 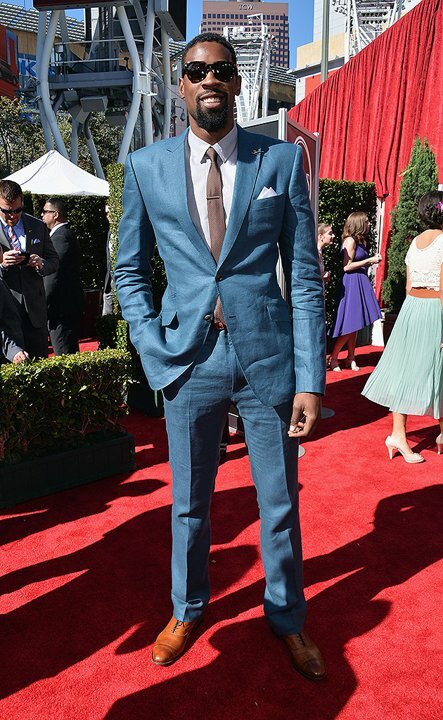 Deandre Jordan (Los Angeles Clippers) steel blue suit complemented the summer season perfectly, great color. ‘The Manimal’ Kenneth Faried (Denver Nuggets) complemented a cream sports coat with burgundy trousers, as NFL Quarterback Russell Wilson (Seattle Seahawks) was all smiles in a shiny tailored suit by Calvin Klein. Tennis superstar Maria Sharapova looked amazing as she graced the red carpet in her J.Mendel resort 2014 dress. Olympians Mckayla Maroney (Gymnast) , and Lolo Jones (Hurdler) both looked lovely in their fashionable frocks. Gabrielle Douglas (Olympic Gymnast), Alex Morgan (US Women’s soccer), and Britney Griner (WNBA player) all went with the ‘All Black Everything’ attire. 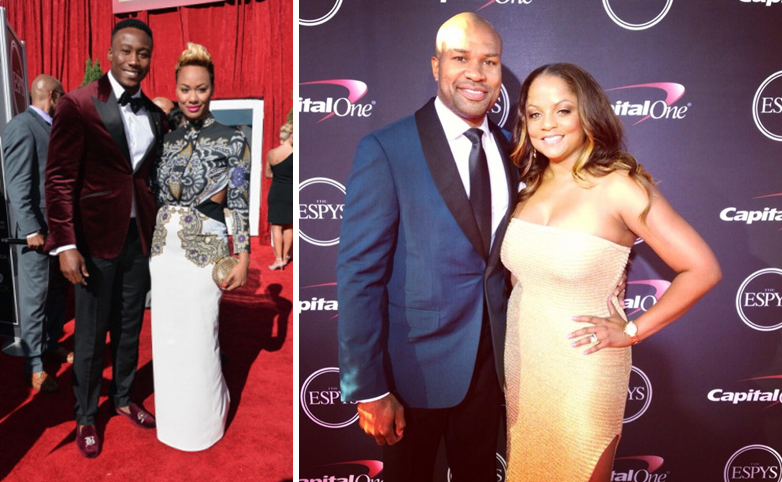 NFL baller Brandon Marshall, and NBA veteran Derek Fisher both sported sleek sports coats. Pro skater Nyjah Huston added pizzazz to traditional black and white with his unique costume.